The return on investments is directly proportional to the underlying risk of the asset. More risk gives more returns. To measure, how much returns investment can make provided given risk is called risk to return ratio. 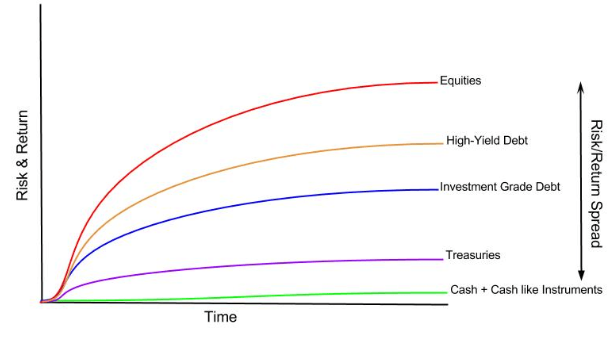 As everybody knows, every asset class has different returns, the following chart shows it instrument wise. You can see cash has no returns or cash equivalents has some returns. Government treasuries offer return which is considered as risk-free. As risk increases returns get increases. Equity is considered as the riskiest class of investment & from the above graph you can see, this asset class offers the highest returns as well. The same concept can be understood by understanding the risk premium concept. The risk premium is the additional returns an investor will gain (or he expects to receive) from buying a risky market portfolio instead of risk-free assets. The market risk premium is an integral part of the Capital Asset Pricing Model (CAPM model) which investors and analysts use to find out the acceptable rate of return on investments. At the core of the CAPM model is the concept of reward (rate of returns) and risk (volatility of returns). Investors always like to have the maximum possible returns on investments combined with the lowest possible risk of returns. The risk-free rate is nothing but a return on investments in Government’s bond. A government bond is considered as a safe investment as a possibility of Government is getting default is very thin or almost no possibility. NIFTY has generated a return of 15 % the previous year, and the current rate of the Treasury bill is 8 %. In the above example, the risk premium on NIFTY is calculated, the same way it can be done with any specific asset class as well. From the above formula, one can understand for taking more risk than risk-free investment, an investor will be getting 7 % extra returns for extra risk. Same way, for corporate bonds it gets applied. Reliance industries corporate bond’s coupon rate is 9.5 % and the Government bond rate is 8 %. So from the above example, one can see investors in Reliance industries will be getting risk premium of 1.5% above the government bond rate. It must be understood that market risk premium helps in assessing probable returns on an investment as compared to investment where a risk of loss is zero, as in the case of Government issued bonds, treasuries. Additional return on a riskier asset is in no way guaranteed or promised in the above calculation or by any related factors. It is the risk that investors agreed to take in return for more returns. 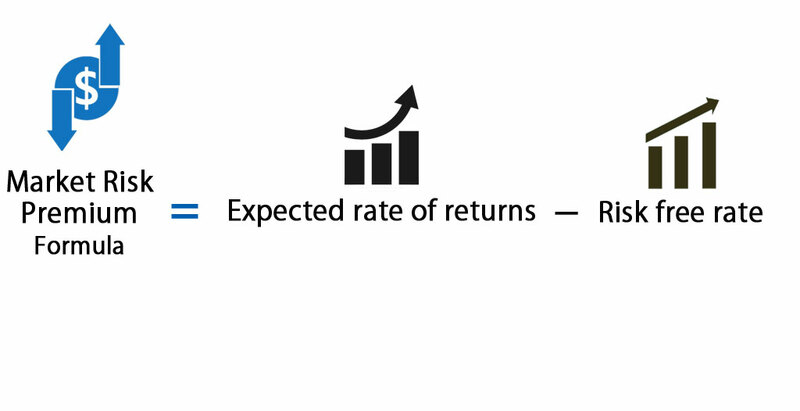 There is a difference between anticipated returns and actual returns, one should make note of that. As already stated above, the market risk premium is an integral part of the Capital Asset Pricing Model (CAPM model). In the CAPM model, the return of an investment is the premium plus the risk-free rate multiplied by the beta of the asset. The beta is the measure of how risky an investment is compared to the market index, and as such, the premium is adjusted for the extra risk on the asset. An asset with no risk has zero betas, for example, in above-mentioned formula the market risk premium will be canceled out with a risk-free asset. On the other hand, a highest risky asset, with a beta of 2, would take on double premium. At 1.5 beta, the asset is 150% more volatile than the market, will take 1.5 times the risk premium. It is important to understand that the relationship between reward and risk is the main reason behind market risk premiums calculations. If an asset returns 10 % every year without fail, it has zero volatility of returns or zero risks. If a different kind of asset returns 20% in year one, 30% in year two, and 15% in year three, it has a higher volatility or risk of returns and is therefore considered “riskier”, even though it has a higher average return profile compared to a risk-free asset. You can easily calculate the Risk Premium using Formula in the template provided. In the first example, risk free rate is 8% and the expected returns are 15%. here Risk Premium is calculated using formula. In the second example, risk free rate is 8% and expected returns is 9.5%.